When the Colorado Ballet agreed, a year and a half ago, to partner with Kroenke Sports Enterprises (the owners of the Nuggets and the Avalanche) to present The Nutcracker ballet at the then newly-renovated Paramount Theatre for the next 10 years, it seemed like a good idea. The Auditorium Theatre, where the company normally performed, was about to undergo a total renovation, leaving the ballet without a suitable home for its biggest money maker. But last year's production made clear, in no uncertain terms, the compromises of such an arrangement. The classic story was cut by 40 minutes, eliminating some of the specialty dances in their entirety and foreshortening other segments. In addition, the extended "halftime" and the general quality of the refreshments added to the sporting event feel of the evening. We were therefore relieved by the announcement that The Nutcracker would be returning with the company to the Auditorium Theatre when that venue re-opens next year. For despite the fortuitous financial arrangement that the Paramount deal promised, its effect on the artistic quality of the season's annual cornerstone production has been debilitating. And while granting that the cramped quarters of the Paramount stage contributes to some of these problems, that alone does not explain a number of shortfalls. Even the restoration of portions of the missing dances this year did little to alter the rushed feeling surrounding the production, instead drawing attention to the anemia of half-realized elements. In addition, certain match-ups were noteworthy in their disparity. 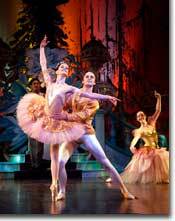 In particular, Nathan Vander Stoep's Nutcracker Prince struggled at times with his lifts of Maya Makhateli's radiant Clara, while they seemed to be dancing in different worlds. 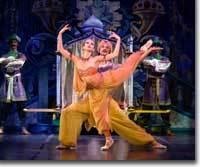 Similarly, Oleg Dedogryuk lacked the lyricism and chemistry needed to take full advantage of Sharon Wehner's sensual performance in the Arabian. The athletic Russian, though performed with exuberance by Takashi Sogitani and Koichi Kubo, and with grace by Janelle Cook, lacked the sustenance to fully satisfy. And the list goes on. Only the grand pas de deux, featuring Maria Mosina as the Sugarplum Fairy and Igor Vassin as the Cavalier, fully achieved its potential, with the well-matched pair given full rein in the showcase number. There were some other splendid moments to be sure, including Sharon Wehner and Koichi Kubo's Columbine/Harlequin turn, James Hernandez' hilarious manipulations of Mother Ginger's dance steps, the always rhapsodic Crystals and Snowflakes, and the live orchestration of Tchaikovsky magnificent score, led by Akira Endo. So, despite the weak elements, it's not as if the overall excellence of the company has somehow faded. 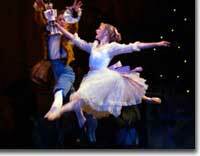 But given the high barre that has been set, this Nutcracker falls short of previous productions. It runs through December 29th. 303-837-8888 or www.coloradoballet.com.